Skype Translator app is a Skype client from Microsoft that supports near real-time speech and IM text translation translation to different languages. 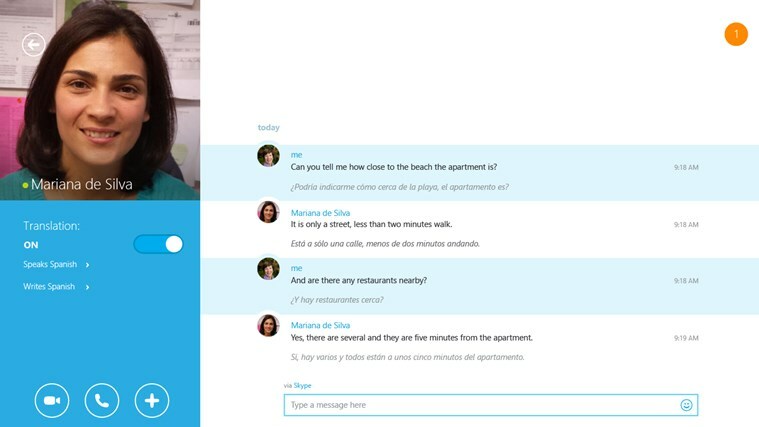 Skype Translator was first released in December 2014 on an invite-only basic for selected Windows 8.1 users. Now, it’s available for all Windows 8.1 and Windows 10 users on PC, tablets or mobile devices, without requiring any sign-up and waiting processes. Skype Translator breaks the language barrier by allowing someone on almost any Skype client who speaks another language to start talking, through instant translation. Skype Translator is currently in preview state, and only English, Spanish, Italian and Mandarin are supported for speech translation for the time being, through Microsoft plans to add more in the future. One-to-one Skype voice or video calls are translated as you speak, in both directions. An on-screen transcript of your call appears, which can be saved. Choose whether you want to hear the translation or just see a transcript. Includes all the regular features of Skype for modern Windows. Translates instant message chats in over 50 languages. Call almost anyone who has Skype, but caller needs to have Skype Translator preview software installed. Download the free Skype Translator app from the Windows Store. Unfortunately, Skype Translator does not have an desktop app version, even though receiver is recommended to use a desktop Skype client. The short video below shows how to use Skype Translator to chit chat with other who uses another language, with the help of near real-time Skype translation.